On December 4th eight guild members shared their completed skill builder quilts. The quilt was designed as a teaching quilt demonstrating a different technique in each round for participants to try some or all lessons. 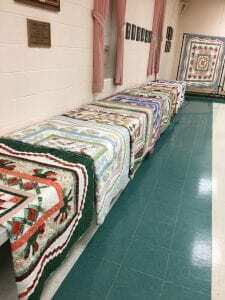 The eight quilts shown below, with the original quilt on the rack in the background, were voted on for Viewer’s Choice. We hope to see all of these and more at our upcoming quilt show in June 2019. Congratulations to all of our entrants for their beautiful quilts and commitment to completion for our reveal date. We hope to see other completed Medallion Skill Builders at upcoming Show n Tells in the new year.